I have had many changes recently which kept me away from blogging. But I am back and this week’s list will reflect what I am talking about on my next show. 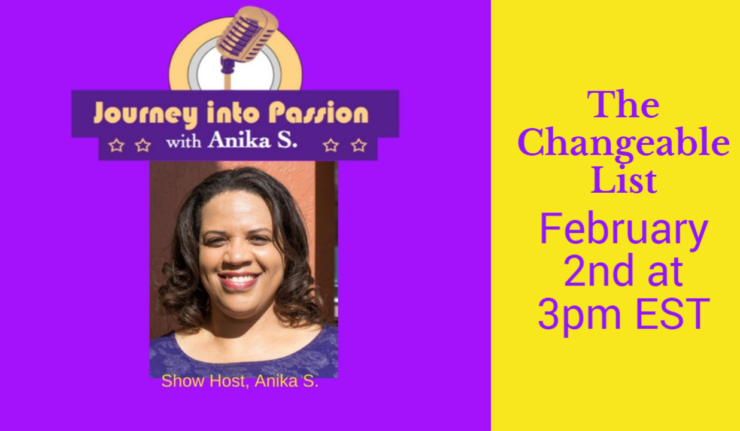 On my next Journey Into Passion with Anika S. broadcast, I will host a show called “The Changeable List”. From the very beginning of the Year of Realization, we need to understand what we should and should not negotiate or change during this journey as we work towards realizing our passions. Now go to Our Progression. I have more to share with you.